My November Birchbox arrived about a week ago but I wanted to make sure I share with you before the week gets crazy with Thanksgiving plans. 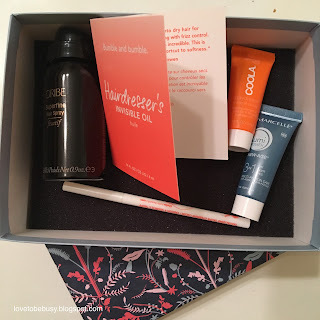 In case you are not familiar with Birchbox, you receive 4-5 samples for $10 each month. You can earn points through purchases on their website that you can then redeem for products on the website. They no longer give out points for reviews of products the boxes. I'm excited about all the products this month except the Coola primer. I find that products with SPF do not agree with my skin on a daily basis (yes, I know this is horrible and I am constantly on the hunt for an SPF I can wear every day). I don't use a pencil to fill in my brows because I've never wanted to buy one and be totally unsuccessful and have wasted money (haha). But I will try this one out, maybe with the clear gel from Anastasia we got in a Sephora box and see how it goes. I like hair oil, hairspray and I have loved almost every Marcelle product I've ever tried. I have to be honest that I didn't even open most of these products. I am trying to work through a product before opening a new one since I have had to throw a lot of things away lately because they went bad. I will definitely use the mask, healing balm, and cleansing milk as soon as I need to open a new one of any of these categories. I have passed along the Parlor by Jeff Chastain conditioner because I don't need volume and texture in my hair. I have also given away the LOC lip crayon because I don't wear red. I tried the Clarins energy booster and it felt nice. I mixed it in with the Clarins moisturizer I had in the box also. I didn't notice a difference with the energy booster, maybe because I have been using a brightening product every day for awhile now. I do like how the moisturizer feels and would consider purchasing it for night time (someday years down the road when all my others are gone lol). I know I haven't tried every out yet, but I am excited to use them. I am just trying to be more conscientious of what I have open at one time. *All opinions are my own. All products were purchased by me. I was not compensated in any way for this post.